After a few weeks of very little fishing due to family commitments, holiday and extreme conditions I was happy to be getting some fishing time in finally. Over the last few weeks I have only managed an hour or two here and there. Last week I planned an early assault with a friend Nick. 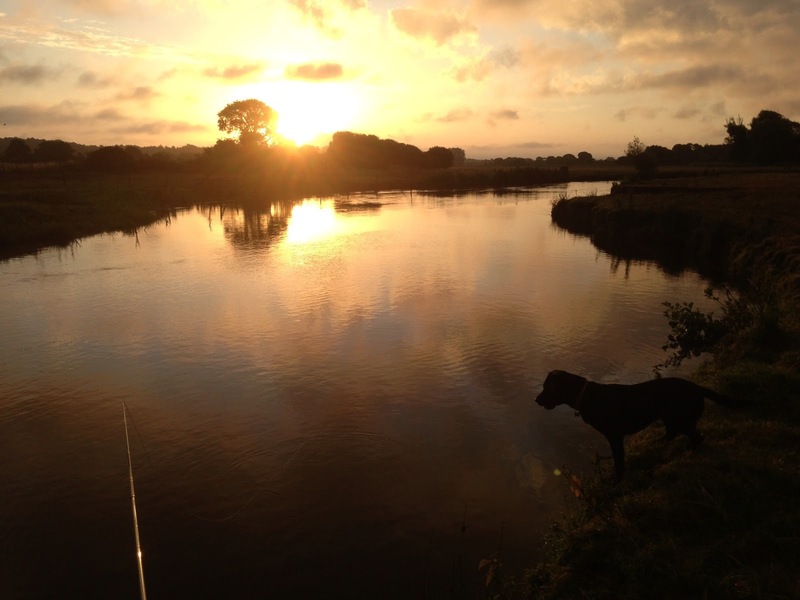 We decided on an early morning session targeting the Sea Trout as the Salmon appeared to be very thin on the ground. We arrived early, tackled up and made our way up to the top of the beat as it started to get light. It always looks and feels very fishy that time of day so hopes were high. Due to the very hot and dry weather the river had been very low for a few weeks but there had been a flush of rain the day before that had lifted the river by 10cms, there was a bit of colour in it too. As we fished down the river lifted a little more and coloured up more. Our high hopes dwindled as we fished through all of the hot spots with nothing but the odd sharp pull to show for our efforts. Ofter a quick snack we put up the spinning rods and made our way to the bottom of the beat. As we spun up the beat we saw a few sea trout but nothing was willing to take hold and the river felt strangely quiet, as it had for the whole of the season so far. We ended our mornings fishing with one Small Sea Trout and one lost fish that Nick hooked, estimated to be about 7lb the fish gave a quick, strong tussle before shaking the hook. As we left, the colour was starting to drop out, maybe the afternoon would have been the time! This week I was to return again, encouraged by the rain in the week and a couple more rises coupled with the tail end of some big spring tides. A quick look in the book in the hut showed that nothing had been caught all week, in fact only one Salmon had been caught in the last 3 or four weeks. I met a couple of guest rods at the hut and after a brief chat we made our way to opposite ends of the beat. I started up at the top end and worked down quite quickly as the week growth had made the top end difficult to cover properly. As I made my way down I was encouraged by a decent fish lunging to grab the Mepp, it missed, then missed again and after a third dash over the very shallow pool tail it missed again and swam back to its lie. I waited a few minutes before casting again hoping it might come again. After a few casts, moving slowly up the pool another fish shot out of the depths and took hold firmly, it splashed about shaking its head and darted around the pool tale and sadly came off. Although it was the first decent fish I'd hooked for a few weeks my spirits were high as something appeared to be 'right' today. 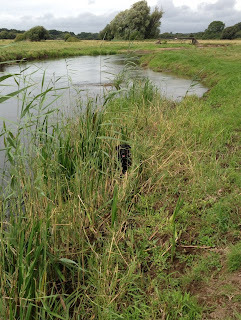 Once I passed the guest rods I walked down to the bottom limit of the beat to fish my way up. Nothing seemed to stir in the bottom few pools until I got to a small pool where I had seen fish, had takes, but never actually caught a fish from. Right in the neck of the pool hard against the reeds on the far bank I had a good solid take. This time it was well hooked and I felt sure this one would end in my favour. I played the fish hard so as not to prolong the fight in the warm conditions and after a quick battle a nice clean fish of about 5lbs was duly returned. It had quite a few red marks on its abdomen, presumably from running up through the shallows over the last day or so. After finally banking this fish my drought was finally over, it was a feeling of relief and elation, even the dog was super excited! I was now fishing with confidence and was feeling like there was more to come. I was fishing better now, as Arthur Oglesby remarked in one of his books, some anglers fish with "the despondent droop" I, however, was fishing with "the expectant erection". I think there is a fair degree of importance in the way we approach our fishing as success breeds success to an extent and I so often see people become despondent when catching no fish. They (myself included at times) fish with little thought as any enthusiasm has long gone. One of two things happens here, they eventually get a fish and as a result, fish better after the confidence boost, or, sadly give up. Anyway, back to the fishing, we (Myself and Poppy) worked up the beat and had a couple of follows from small sea trout. Once we got to a deep pool I put on a heavy 'Rollo' spinner to get down into a fast deep hole. as I swung the rod back for the back cast the dog shot up the bank for no reason and got clonked right on the snout by the heavy spinner. It made a sickening sound and must have been quite painful. The spinner was now attached to the dog and an interesting fight was about to commence. Luckily, as she is relatively well trained I managed to stop her running off by shouting "no" and after a couple of head shakes and some yowling the spinner came off. We were both tankful and it was the shock rather than the physical pain that left her looking frightened. I thing she thought that i had done it deliberately as the would have associated my "no" with the pain. This is exactly what happens when she touches an electric fence. The spent the rest of the morning squeezing between my legs or hiding in the long grass looking terrified of the spinner. When we got to a nice long streamy run I was taken solidly by another fish, this was another fresh Grilse and was putting up a very spirited battle, This is a lovely bit of water and I had always hoped to catch a fish from here but never managed, the fish was almost ready for the net and had one last lunge and with an impressive display of acrobatics it came un-stuck. The dog had sneaked out of the long grass and was sat between my legs watching the fight looking a bit more excited that frightened. 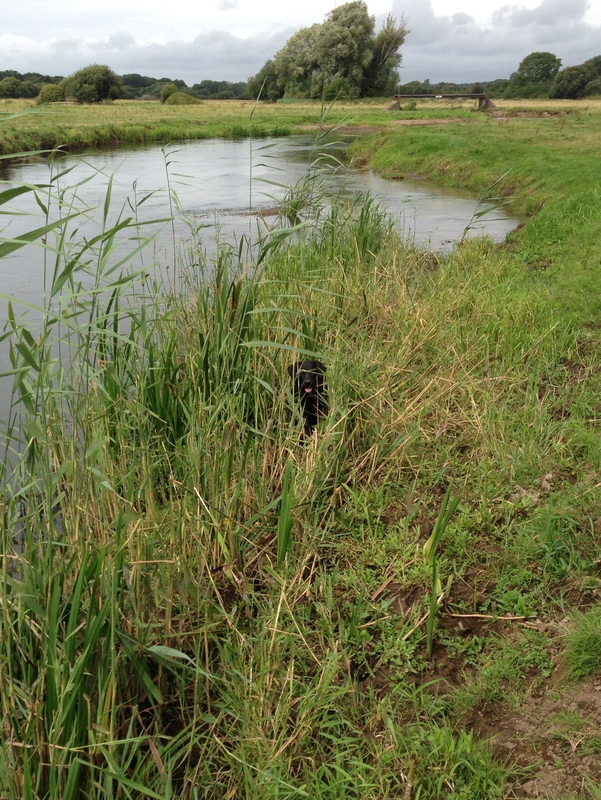 As soon as I reeled in to re-cast she shot off back to the safety of the long grass. As we passed the middle footbridge I walked past the big pool and had a couple of cast in a deep hole I don't normally fish and was pleasantly surprised when a good fish took hold and shot off upstream, after a couple of initial runs the fish was tiring so I managed to get the fish netted and returned from the high bank safely. It was a good fish of around 8-9lb and again, like the others, fresh as a daisy! I had been fishing to 3 1/2 hours by now and was surprised at how well the river was fishing. Clearly, there had been a decent run of fish and judging by the marks on the underside of a couple of them they had struggled in very recently n the low water. 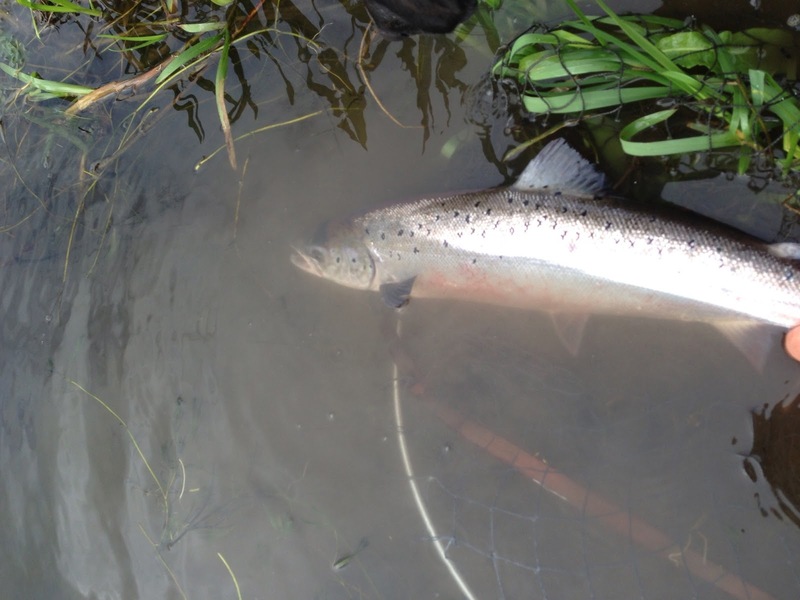 The tides seem to be the trigger for fish on the Frome as there are rarely and summer spates. I rang Tony on my way back to the hut, he had fished Friday and hadn't seen a thing, the fish must have just arrived and were clearly in a taking mood. This was further proved when I saw that one of the guest rods had also returned a fish of 8lbs. Once the spinner was firmly zipped up the dog relaxed and came for some reassurance, although it was a shame to leave the river in such good order Poppy was thoroughly relieved and couldn't wait to go home, I guess we all have to compromise and Poppy had had a pretty crap day!